Famitsu: This game had been discussed as a shocking collaboration, but could we ask from the episode of the project establishment time? Hayashi: That’s why at that time, we were in a condition where we couldn’t talk about it despite wanting to talk (laughs). 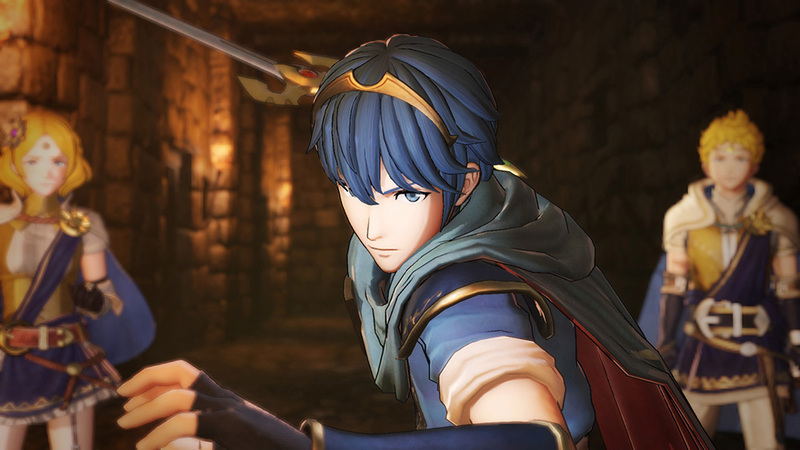 Originally, the thought that realizing a Fire Emblem Warriors would be interesting came from us (Koei Tecmo), and when we brought the project to Nintendo, the talks became ‘let’s make this on the new console!’, and we proceeded with rapid strides. The new console of course now refers to the Nintendo Switch. Yokota: When we received the proposal, I remembered giving an immediate reply of ‘It’s good!’. Higuchi: After that, Nintendo sent the talks to us. Our company (IS) also got hyped, like ‘That sounds interesting!’. Famitsu: That interesting title is being steadily made into shape like this, but could you tell us on the direction all of you are aiming for, on top of developing this game? Hayashi: First of all, what we have decided from the beginning was “to make a Warriors game that can be enjoyed by Fire Emblem fans”. Yokota: There are also many titles in Warriors series, and there are also infinite variations in directions, but we had always been discussing with Koei Tecmo Games on ‘what is the Warriors desired by fans of the original works’. We’ve been making choices to adopt or reject features one by one, such as wanting a system from the original works (FE), or a system that exists in Warriors series but is not suitable for Fire Emblem Warriors. But at that time we always proceeded the talks by putting ‘being enjoyable by fans of the original works’ on mind. Hayashi: The series has had a history this long, so each staff in the development team has very fond memories of Fire Emblem. That’s why we had totally rough passages in discussing which features should be included. Famitsu: These have been published in this article, but we’re wondering on the relations between characters, such as what kind of conversations Chrom and Marth will have, and what they will call each other. Yokota: Supervision for things like such character settings is being dealt with Intelligent Systems, starting from Higuchi-san. Higuchi: This time [the game] is fully voiced, and there is also an enormous amount of quotes. I remembered being surprised at the thickness of script book for voice recording when I looked at it. Hayashi: Many people in our company (KT) were also surprised as regular fans, like ‘This character speaks like this!?’. Hayashi: You’re wondering about it, right? (laughs). The development team had been always debating on things like ‘This character is definitely required’ or ‘Isn’t this guy more important than that guy?’. Yokota: Thankfully, everyone’s fond memories are so strong. Hayashi: It’d be bad for us to make everyone impatient, so I’d like to say about this beforehand. Basically [characters] will be coming from Shadow Dragon and Awakening, and also Fates. So not in a form of… a gathering of protagonists from all series. Famitsu: I see. So that means you’re narrowing down the titles. Hayashi: There’s a reason to this. If we only put protagonists from each titles, the majority would be dominated by characters who use Swords. And in that case, the Weapon Triangle system would end up not functioning. Famitsu: And [the list] kept getting added. Hayashi: By combining such various opinions, we finalized the participating characters. As a result, we are preparing more playable characters than the 1st titles of other collab Warriors series! We are also adding Archer and Mage-type characters in there, taking a balance of classes. Famitsu: In this game, Shion and Lian are appearing as protagonist characters, but please tell us on the details of them becoming born. Hayashi: It’s the decision that putting original characters on the core would be better. We wanted the likes of Marth and Chrom to have side-by-side relationships. With that, it’d be better if we construct it s othat the protagonists stand on their own, and legacy characters appear to help them. Higuchi: They are characters that grow by borrowing assistances from people, so we made the setting for them to be a bit younger than legacy protagonists. Yokota: When the settings for Shion and Lian were being created, it proceeded right at the same timing as creating original character settings for Fire Emblem Heroes. When we looked at Shion and Lian’s designs, there were talks that the designs and settings alike are ‘similar!’ to Heroes’ protagonists Alfonse and Sharena. Higuchi: That’s why we planned to differentiate them so that they’re not too similar. Hayashi: But the voice actress for both Lian and Sharena became the same Uchida Maaya-san though (laughs). Famitsu: (Laughs). In this game, is the setting like ‘Heroes living in other worlds being summoned into the world Shion and Lian live in’? Hayashi: We still can’t state it clearly yet, but please think of it for now as them being called by the “Fire Shield” in this world, and coming here by crossing over dimensions.